A regular part of RJsCorner is going to be looking at Will Rogers quotes and seeing how they apply in today’s world. So, this is the first of many in that area. Even 80 years ago it seems that there were more than a few who thought religions did more damage than they helped. I think what Will was saying is that “Bible thumpers,” and whatever they are called in the other religions, are the most intolerant of differences of faith. They are just convinced that they are the only one who has got it right. This is what gets us into so many wars. The Sunni and Shiite quarrels cause thousands of deaths a year against each other and even to some of our boys and girls stationed over there trying futilely to control them. Not that many years ago it was the Irish Catholics vs. the Protestants and so on, and so on… People disagreeing with others about religion seems to be the norm in our world and we can’t figure out how to get past that ignorance. I am a big believer in “Coexist.” That is telling ALL the faiths to just play nice. If we could only manage that, war deaths could be almost eliminated. Let the other fella believe what he wants as long as he lets you do the same. It couldn’t be simpler than that. But sometimes the simplest things are the hardest to actually accomplish, aren’t they? It is becoming more and more recognized that religious beliefs are and have most likely always been one of the primary sources of conflict in this world. Tribal tendencies are natural for humans who need groups and community to survive. But the driving forces behind especially alienating, fundamentalist beliefs are a combination of nature and nurture, experts say. Personally, I have always struggled to fully understand why religion has such a strong hold on so many. The quote above helps me understand that a little better. I am just not one of those people who believe things without proof as most religions demand. What will it take for religions to finally come to agree to coexist in the world today? That is the major question at hand. When will they accept that everyone has a right to believe in the god of their choice or no god at all? Thomas Jefferson understood that early on and thankfully at least the concept is part of our constitution even if it hasn’t been fully implemented. In fact, Jefferson was more strongly a believer in freedom “from” religion than “of” religion. Given that there are literally tens of thousands of versions of God in the world today coexistence is the only logical way to approach religious beliefs. The words in the title above have been around for probably eons, but I kinda think they have been forgotten in today’s world. It seems that everyone wants everyone else to live their life as they do. Christians can’t tolerate non-Christians, Muslims think they need to kill anyone who doesn’t share their beliefs. And then there is the RedAmerica vs BlueAmerica, that divide is becoming too wide to even think of breaching. Live and let live seems to be a forgotten phrase today, but I kind of think it is the solution to most of our problems we face. Let others believe whatever they want as long as it doesn’t hamper our ability to do the same. Quit jumping on your high-horse in order to reform the world to your liking. Of course, I need to practice what I preach. Some of my posts are just too judgemental of others. I tend to criticize when their worldview does not match mine. I try to be constantly aware of this but sometimes it leaks through. I have a bumper sticker displayed on my vehicles with the word “Coexist”. It refers to asking all religions to live and let live with each other. But I kinda think it should be expanded to other areas of our lives too. My prayer for this holiday season is that all the religions of the world finally agree to coexist with one another and not try to force their individual beliefs and dogma on the rest of us. If only we could all quit killing each other in the name of our particular version of God this alone would go a LONG ways toward world peace that we all seemingly pray for.. 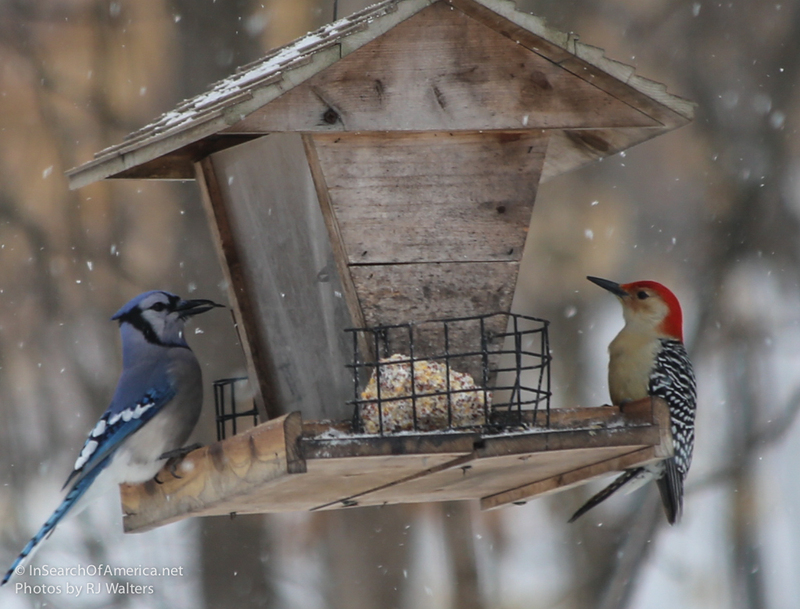 The Blue Jay and the Red-bellied Woodpecker are not terribly friendly with each other but they do, for the most part coexist with each other at our feeder. If only humanity could accomplish the same thing. Coexisting instead of the constant wars. If only…. Of course this is my virtual desktop and not my physical one. Although they both represent my cluttered existence I guess. Chaos … Good News as far as complacency is concerned.